The first gift I gave my mom was a dandelion bouquet. 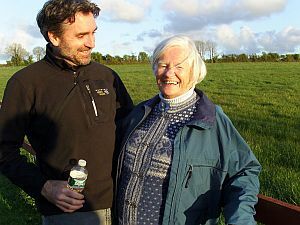 When she turned 80, I brought her to Ireland. It was a gift with a hidden agenda. Born Johanna O’Sullivan, she was one of seven raised by Irish-born immigrants in New York City and later Long Island. There, she was groomed for the convent. With her bags packed for the holy life, she balked and chose a career that eventually led her to Manhattan and to date a Hollywood rogue, Steve McQueen. Mom didn’t know it, but part of our Irish quest was discovering what might have been if she had taken the oath. We began our journey with family in County Limerick. 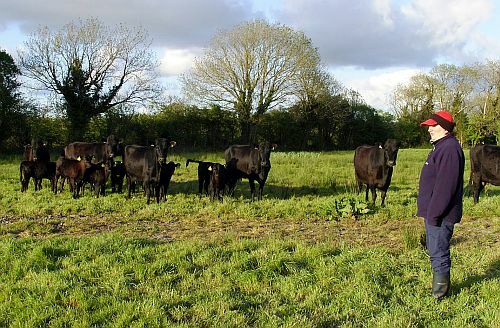 Our Irish kin own a hilly cattle farm in Loughill, near the village of Athea, where my grandparents met as kids. With a walk down memory lane, we celebrated my mom’s dedication to keeping in touch the old school way, via letters. Our cousins’ songlike brogues made it real. Rolling across County Galway and sometimes harrowing, narrow roads made slicing between trucks and stone walls a test of nerves. Otherwise, the rolling green scenery, classical music on the radio, and mom as co-pilot was bulletproof leisure. Passing into Connemarra’s highland barrens—from woodsy green to stark mountains—we never exceeded 20mph and only saw three other vehicles in an hour. Although gorgeous stone churches are at the heart of most villages, Irish convents are rapidly closing, foretelling a fading way of life. 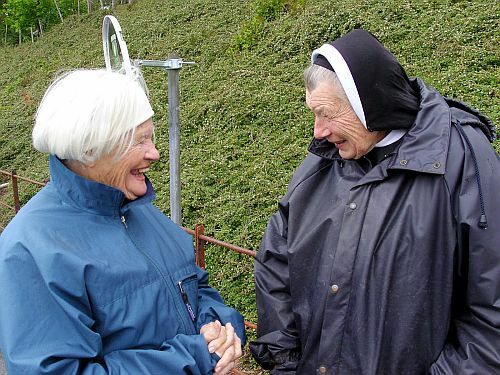 It’s hard to find a nun in Ireland these days, but we were determined. 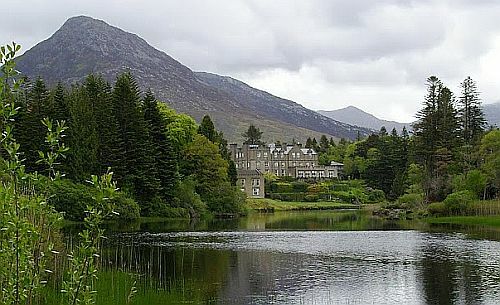 Our wish was granted by an unscheduled stop at Kylemore Abby, a legendary convent and boarding school. 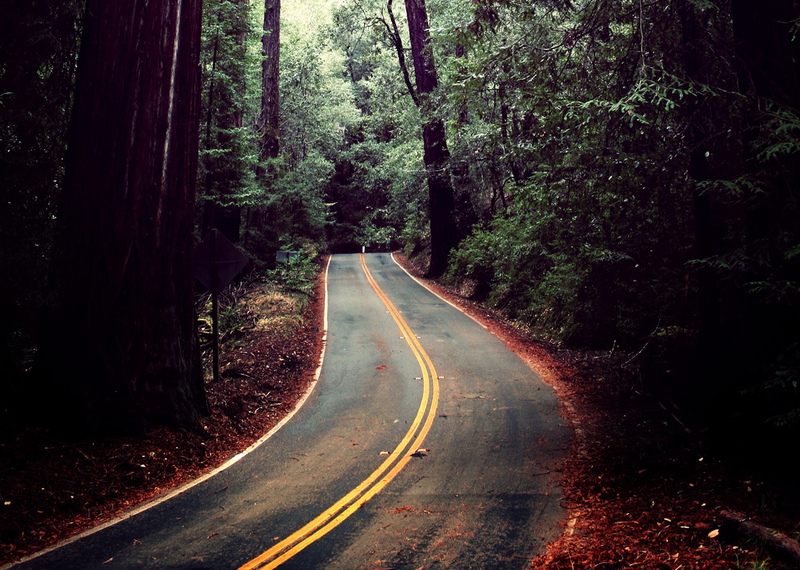 We encountered one nun in seven days, and she was stealthily driving along the abbey’s utility road in a beat-up minivan. Before she could get away, I knocked on her car window, and she emerged wearing a habit and knee-high Wellington boots. She and mom chatted about Catholic school teachers and outfits. Fast friends—so close yet so far—they held hands for a moment before saying goodbye. Right then it hit me, if mom had donned the habit, my dad would never been able to use his line, “You have great legs,” when they first met on Long Beach, New York in 1949. 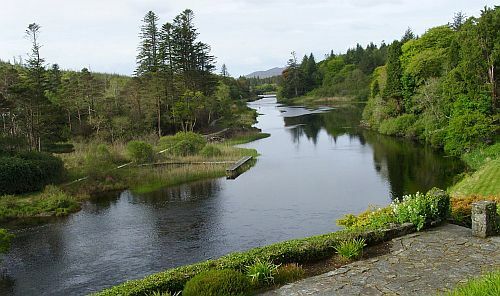 Out of the barrens and back into the woods, the grand entrance to Ballynahinch Castle crosses a one-lane stone bridge, and into another era. This sprawling landmark doubles as an art gallery, with old local photos and paintings lining a mile of walls. Defining quietude, enchanting riverside trails pass lakes, cross pedestrian bridges, and antique cottages. It’s Ireland’s Vermont. Rounded mountains loom over this lush river valley that’s a fly-fishing heaven for the fisherman we met on hikes, who were going after wild Atlantic salmon and brown trout. For some, this is the royal fishing lodge. Built by one of the 14 original tribes of Galway who reigned during the 13th to 19th centuries, it has been a hotel for 65 years. The slow-roasted serenity followed us inside: peat fires warm the lobby and an old-style pub serves roast woodcock. Mom delivers an old book from the library along with a hand-pulled brew—a trusted formula in this benign beacon for poets, writers, and painters. 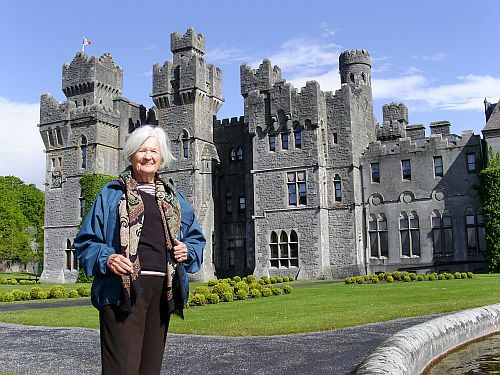 After reading The Irish Times and The Irish Independent cover to cover, mom looked up and asked, “Time for a hike?” En route, on a bridge over the untroubled Owenmore River, we met Noell, one of the castle’s historians. After his Gaelic-infused lecture on clan and tribe infighting, we continued our riverside hike, holding hands for safety like I did with my daughter before “kindergarten cool” set in. Hand holding, throughout our lives, says everything without words. Mom’s journey from a convent runaway to Manhattan ultimately led her to my dad, an avid birdwatcher. She relied on a few supposedly Irish traditions to keep her sons in line, including washing our mouths out with soap for swearing and attempting to use a wooden spoon on our behinds—a course of punishment rendered fruitless by a fugitive dance around the dining room table. But it certainly wasn’t all tough love. An Irish relative, Sister Eileen, visited us when I was nine. She pinch-hit for mom as a bodyguard, deflecting older brother attacks. She also never minded when I waltzed into her room unannounced when she was sans habit. And, she didn’t notice my English-descended, Thoreau-loyal father peering curiously at her when she prayed before every meal. With castle magic in the rear-view mirror, we steered for the City of the Tribes. In one of Galway’s many inviting pubs, a patron commented on the current state of Ireland: “No texts, tweets, or emails coming from above or below—so live now.” That said, Irish nuns, and nuns the world over, are still doing work that most don’t consider: running orphanages and caring for the homeless. Many nuns and priests in today’s Ireland are from South America, Africa, and the Caribbean. “They take on Irish accents,” that same pub philosopher swore, clinking my mug with his. Ireland is proof that pride needs no flag, and that magic cons reality. An island reminding us to unfold our days like maps, understanding that we rarely refold them the same way. If life is a slowly evolving painting, Irish brushstrokes spread lasting memories. I continued the dandelion bouquet ceremonies until I was seven and literally picked up where I left off this past Mother’s Day. While strolling by one of Ashford Castle’s gardens, we chanced upon another patch of pretty weeds. I picked a bouquet of bluebells—dainty purple wildflowers flopping off green stems—presented them, and thanked her for letting me roam out of bounds. In a glorious ancient setting, but now only partially beholden to an ancient text, she’s blessed by that slightly wild streak that inspired her journey…and mine. 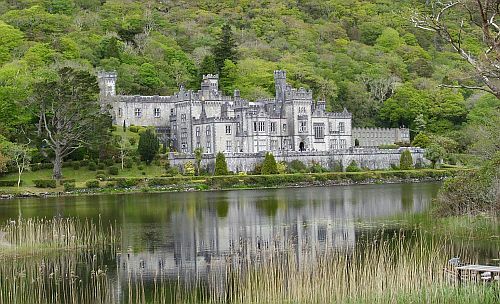 Discoverireland.com is an amazing resource including suggested itineraries, festivals, and events. This entry was posted on July 3, 2012. It was filed under Published Articles and was tagged with ireland, travel.